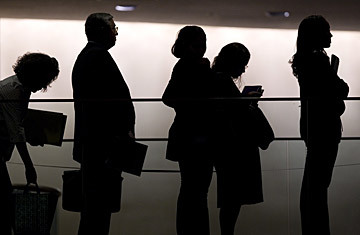 Hundreds of job seekers stand in line at a job fair in New York on Thursday. The economy is losing between 600,000 and 750,000 jobs every month by every measure that the government and analysts use. This rate of job losses may go on for a relatively long period. This trend can cause people to believe that trying to find a job is hopeless and that the tidal wave of the recession will overflow the financial mooring of every person who has ever worked or may want to work again. Job creation is like every other part of the economic fabric. Even when an economy is at its worst, some small set of firms which usually have capital and a need for workers find that labor costs are so low that the risks of bringing in a new person or people is extremely modest. And, of course, if the burden of employing new workers is too great or the company's prospects turn worse, the most recent people hired are often the first people fired. Hiring a new person in a strong downturn takes a certain amount of courage. At this point courage is being aided by the calculus of workforce filled with a huge number of people who are willing to work for much less than what they were paid in their former jobs and are often overqualified for most new positions they might find. Investment bankers actually do look for work as retail store clerks if they need the money enough. Unfortunately, no company in the retail industry will hire a soul until the next holiday season. The forces needed to create the right environment for new employment opportunities are simple to understand. The first is that not every enterprise can operate with half the number of people it had a year ago. In many cases it is simply impractical. A factory that still has the number of orders a twelve-hour shift of twenty people produced cannot do that work with ten people. Someone from the company retires, gets ill, quits, or, saints preserve us, finds a better job somewhere else. That person has to be replaced and can probably be replaced for less pay than the person who left. The number of applicants for the job may be a hundred times what it was a year ago. The employer has the pick of a large and almost certainly qualified field. The other less attractive aspect of a very modest increase in hiring is that employers smell blood in the water now. They look at a line of two thousand people at a job fair that might have forty positions available in total and tell themselves that it is too good to be true. But, it isn't. Those PhDs will actually take a job for $10 an hour. It may be the only way that they can survive. The recession is still at a stage where for every person hired in the economy, ten may be fired. The liberating aspect of this is that companies now know that the markets for almost all goods and services will be down for a very long time. There are few illusions left that economic activity will be robust again in the second half. From here on out, every once in a while, an employer will stick his head out of the storm shelter and see a hiring opportunity, and one he can take advantage of without risking his whole business.